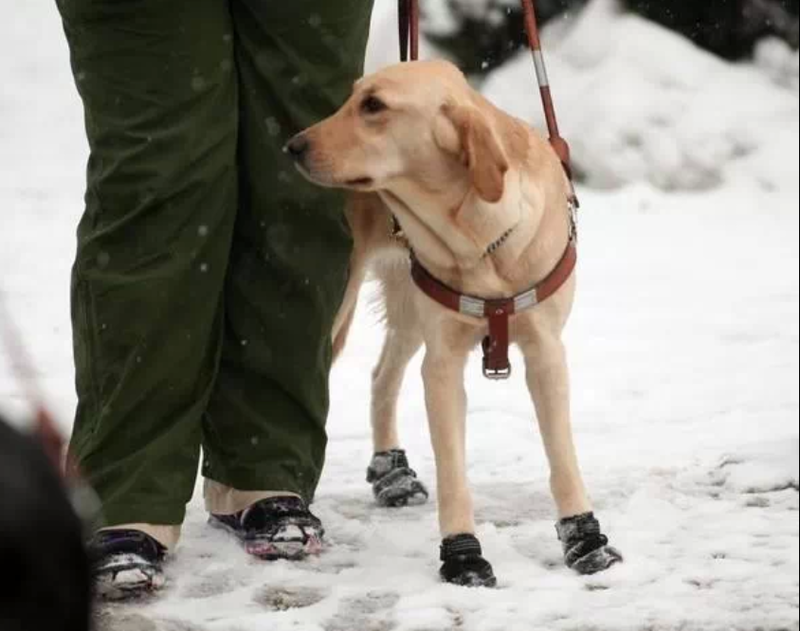 Ladies and Gentlemen, may I present to you, my 5th Seeing Eye ® dog, Dora. Shes a lab/golden cross, about 60 pounds, 22-1/2 inches tall, 18 months old, very smart, and absolutely adorable. Dora and I met at the Seeing eye in Morristown, NJ on February 5. together, we charged down the snow-covered sidewalks of Morristown, affirming her skills at observing street crossings, even when the curb ramps were piled high with snow and ice. I say charged, because this little power house has 2 speeds, hurry, and hurry faster. She loves to work. Ive always been jealous of dog guide users who claim their dogs virtually leap into their harnesses, and now I have one! You might recall the blizzard that dumped 2 feet of snow on the east coast early in February. Thats when I was trying to get to NJ. My flight was cancelled and then cancelled again. I was lucky though. I just had to turn around and go home from the airport. Many of the students in my class were traveling from the west coast, and they were stuck in airports for 6 hours or so. One of the days during our training, we got hit with another snow storm and had to stay indoors all day. We found things to do, obstacle courses in the hallways, clicker training, grooming, laundry, and naps. Especially naps. But we still had to take the dogs out to empty. Let me tell you, it was brutal, standing out there in the wind and single digit temperatures, with the ground covered with ice, begging our dogs to please hurry up and just do it. 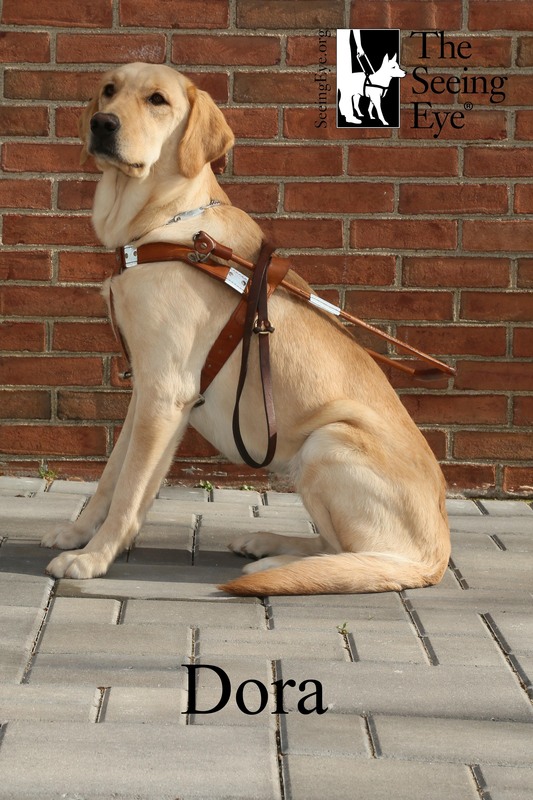 In another post, Ill describe what its like to train with a Seeing Eye ® dog, but for now, Ill just say that Im looking forward to spending the next 10 years or so with my darling Dora, my Dora, the explorer. 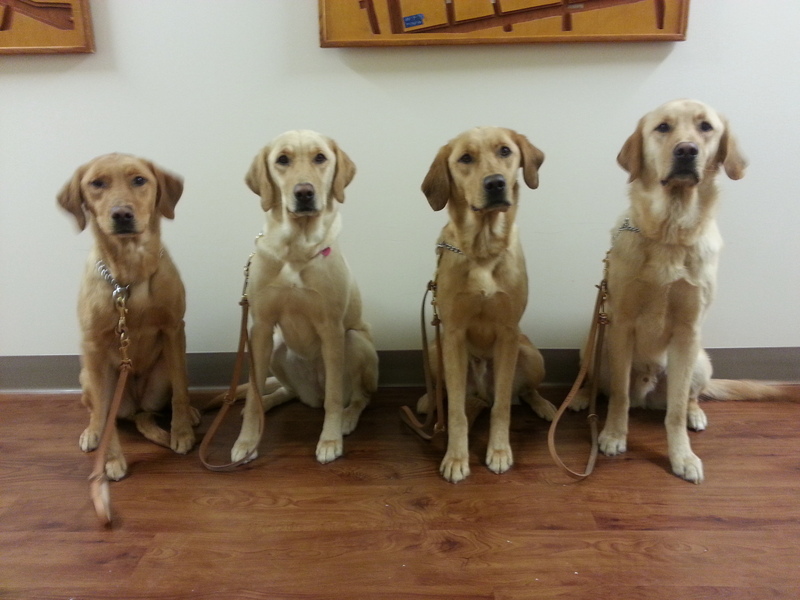 One of the photos accompanying this post shows Dora with 3 of her littermates who were all in this class. Arent they beautiful? I wondered if you were training a new dog, I have been missing your posts. I love hearing from you and learning things that I never would have thought about being blind. You have enlightened me so much and I’m trying to understand more. Thank you for your writings. Congratulations. Looking forward to meeting her. Get ready for all the “Dora the Explorer” jokes….